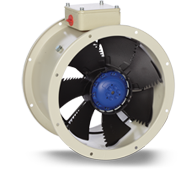 The Short Case Axial EC Series fans incorporate the latest state-of-the-art EC motor technology. The range features fully integrated, infinitely variable speed control which eliminates the need for external VSDs, current overloads and motor phase protection. They are an energy saving solution and are most efficient where conditions vary during the course of the day. Optional matching sensors monitor the ambient conditions in a space and provide real time feedback to the fan. The fan's on-board microprocessor adjusts the motor speed and therefore modulates the ventilation rate to match the specific requirements of the area. The Short Case Axial EC fans are a simple "plug and play" system which means installers do not need to have specialised control programing knowledge. They are available in 7 sizes ranging from 250 to 630mm diameter. Exhausting or supplying air to applications handling clean, ambient air. Also where automatic air modulation is required. EC motor features reverse polarity protection, locked rotor protection and soft starting. No additional electrical protection such as contactors are required. Diameter sizes 500mm and above can be pre-configured to suit specific sensors and specific applications. A full range of sensors are available including differential pressure, temperature, air velocity and pollutant. Compact, short case design with light-weight but robust construction. Low noise, high performance impellers with enhanced aerodynamic design. An electric junction box is fitted as standard. Capable of operating at temperatures up to 60 °C. Units can be mounted at any angle.